The first Simone Elkeles I read was Perfect Chemistry and I really enjoyed that one. This one... not so much. I intended to rate this 4 stars but after much thought I decided this is more of a 3-star book for me. I haven't had the chance to read Catching Jordan yet so I don't share the same sentiments with everyone who has. The whole concept of a girl being on a football team was new to me and I found it to be really interesting. I liked that Ashtyn's into sports and that she's a tomboy most of the time. The only time she dressed like a girl (the kind that liked to show a lot of skin) was whenever she was around her quarterback boyfriend, Landon, but you just know she was only doing it for him. She actually felt more comfortable in hoodies and hockey jerseys. Ashtyn's pretty kickass if you ask me. Even when Derek came along and bugged her out constantly, she didn't lose herself. Mostly. Oh Derek. The southern cutie. He's a bad boy alright but he's not the stereotypical bad boys we read about. He's good at getting people all riled up and he actually enjoys them but what's great about Derek is it's not just an act... he really is just like that. And he's genuinely cool. I don't know how to describe it, really. I just know that I didn't roll my eyes constantly whenever Derek would amp up the bad boy charm. Well, I did roll my eyes whenever he'd call Ashtyn "sugar pie." But whatever. Derek's likable, plain and simple. I like that football's at the core of the story. While it's not a sport played in my country, I still enjoy reading about it. It got me interested in the sport that I did my research after reading. (Too dorky? Hah) It would've been better if we saw more football action. But I understand that there weren't a lot of it because they were on a school break. More detailed practice scenes might've been better. I wanted to see just how good Ashtyn was a kicker or how she was with the team during practice. I wanted to see what made them vote for her as captain. Another thing that I wasn't so hot about in this book was the romance. I'm glad they didn't fall in love in the first 30% of the book but when they did drop the L bomb, it didn't seem genuine. Ashtyn started off with hating the dude to being scared of telling him about her "teeny tiny" crush then she moved on to feeling in love with him so fast. It was confusing... mostly because they barely knew anything about each other. I could accept insta-love if they actually got to know each other, even if they did it in a span of a week, which clearly wasn't the case in Wild Cards. Ashtyn and Derek spent more time getting on each other's nerves than actually talking. Talking about stuff that matters, that is. At least Derek knew a lot about Ashtyn so I sort of understand how his feelings grew. Ashtyn on the one hand... yeah, not really. Derek was so closed off. To me it was purely physical for them, and I get that. But to go from crushing on someone to all of a sudden loving them is a no-no for me. Luckily, the big gesture at the end was awesome. I momentarily forgot about my complaints. I wish the next book would still feature Derek and Ashtyn. 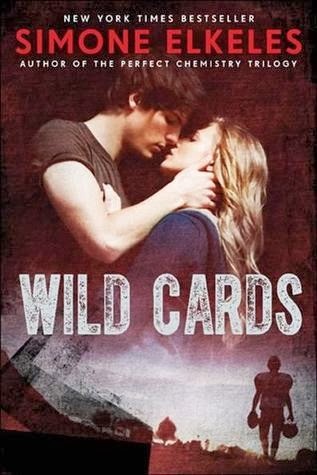 I want to get to know the other characters more but there was so many things left hanging in Wild Cards! Will Derek earn the team's trust? How will he earn it? If Derek does make quarterback, which I'm 99.9% sure will happen, how will it affect his relationship with Ashtyn? I want to see their dynamics on the field and off not that they're officially together. Gah! Please let book 2 still be about them. I'm not done liking them yet. Haha Derek sounds like a bit cocky and that is awesome :) I look forward to reading this one too, thanks for the great review Sab!